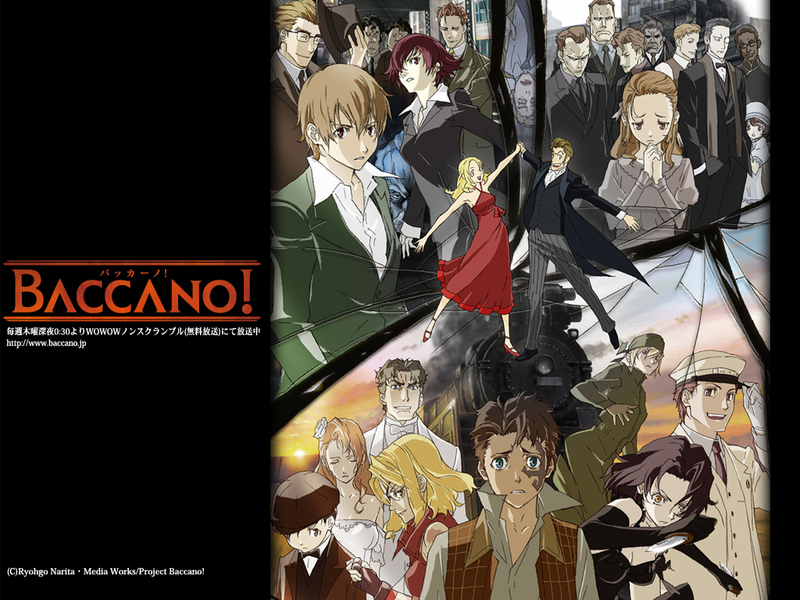 All Geeks Rejoice: Wicked Anime Reviews #29 Baccano! Different Mafia groups, thieves, sociopaths, alchemists, and immortals all cross paths thanks to a train and certain events that spiral out of control. I can't review this the way I normally go about it and I'm not even sure I can properly review something like this at all but here it goes. Baccano! is a wild ride from start to finish. It's pure enjoyment bottled up in a way that you wouldn't expect as all the rules are broken here. There isn't a main character, there isn't a true beginning, there isn't a true end, and this show definitively proves that it doesn't need any of those things to have a top-notch narrative. The story jumps focus on purpose to leave suspense for when and what events occur as the characters drive the story simply by being themselves. Narita, the writer, even admitted that he simply let the characters act as they would which drastically changed everything he originally planned. The characters are the real focal point of the show and it shines through as you're watching. Regardless of the large cast, they're all unique and have this presence about them that keeps you aching for more from them. The level of detail on the finer points has to be applauded as well. The art director and other staff actually visited different parts of New York to accurately portray the scenery. Casting for the English dub was said to have possibly been the longest casting session of anything Funimation has worked on (and it shows, this is actually an incredible English dub that you could argue is better than the original Japanese dub thanks to the work put into the multitude of accents and how fitting the voices are to each character). The music is another strong point as the soundtrack not only sets the mood but it manages to be memorable. About the only negative thing I can see for miles is the fact that the story jumps around on purpose. If you watch Baccano! to the end then it explains it all but some people prefer a point A to a point B. This show proves that you can't actually use a linear timeline with this story so I suppose those of you that are in that boat will just have to learn to go with the tide. This is Kylak signing out and reminding you that you have a gun in your heart!